Yunus Emre was a famous Poet from Turkey, who lived between 1240 AC and 1321 AC. He was a Turkish Sufi poet. 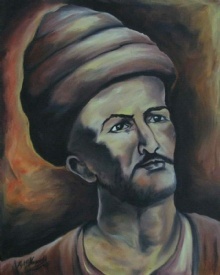 He was one of the first poets of Turkish mystics. Yunus Emres poems are very popular in both Turkey and the West. It is known that he was a pupil of Taptuk Baba, who was a pupil of Barak Baba, who was Sari Saltuk's pupil. This suggests that Yunus Emre probably was a qalandar dervish, which his poems also pointing to. A part of his life are also thought to have spent as a student of Haji Bektash. According Bektashi source Vilayetname, Yunus Emre is buried in the village Sarıköy, which today is called Yunusemre and located in the province of Eskişehir. Our collection contains 3 quotes who is written / told by Yunus, under the main topic Home. "Thought is an errand boy, fear a mine of worries"
"A heart makes a good home for the friend"
"If I told you about a land of love, friend, would you follow me and come?"